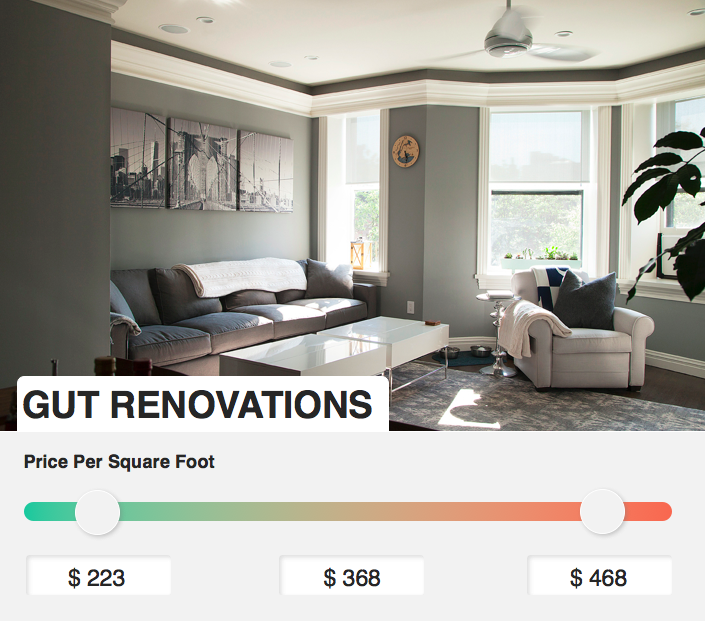 Bathrooms in NYC typically start at $20,000, Kitchens $30,000, gut renovations (including combinations and conversions) $150,000. Over 65% of projects carried out by Bolster Professionals in Manhattan and Brooklyn are in the $200 to $500 per square foot range (Grade ★★). The quality of materials and finishes used in this range differ only very slightly with most owners opting for a level-5 finish wall, custom millwork and Wolf and Viking appliances. The biggest variable by far is the type and quantity of work being carried out. Therefore, the biggest lever you have to control the price of your project in this common price range is the scope of the work (e.g. the layout you choose and the amount of build work you decide to do). If you want to base your renovation project's budget on some solid economics, look no further than your home. The following table uses historical Manhattan real estate values to help you set a budget that is proportional to the value of your home and able to be recovered within 5 years. * Equivalent to forecasted increase in property value in 5 years minus cost of finance at 4% APR.